Our Disney Wedding website sharing our stories, pictures, and advice for anyone wanting or having a Disney Wedding. 8. Vote for Us for a Dis­ney Fairy Tale Wed­ding Vow Rene­wal /2011/04/vote-for-us-disney-fairy-tale-wed­ding-vow-rene­wal.. 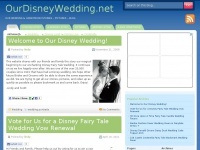 The web server used by Ourdisneywedding.net is located near the city of Scottsdale, USA and is run by GoDaddy.com, LLC. There are many websites run by this web server. The operator uses this server for many hosting clients. In total there are at least 388 websites on this server. The language of these websites is mostly english. The websites of Ourdisneywedding.net are served by a Apache server. The content management system WordPress in the version 3.1.1 is used. The markup language of the website is XHTML 1.0 Transitional. The visitor analysis software Google Analytics is used to analyze the visitors of the websites. The website does not specify details about the inclusion of its content in search engines. For this reason the content will be included by search engines. In order to display ads the Google Adsense advertising network is used.